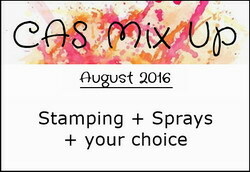 I'm adding this to the gallery over at CAS Mix Up August Challenge - Sprays. Hope to see you in the gallery! 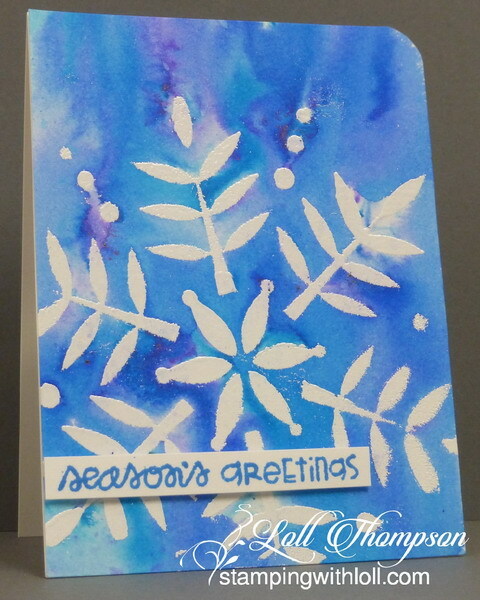 What a fun and creative use of the stencil Loll - love the white over the fabulous blues! Love this Loll! Also love the simplicity and versatility of this technique. Fab card Loll and since the retreat I'm hooked as well!!!! Stunningly gorgeous. Love those little pots too as you never quite now what you are going to get! And boy to you get fabulous! You have the best luck with Brushos - me? not so much! Loll!! This is AMAZING! The watercolor wash, the gorgeous embossing. <3 <3 <3 Love it! What a gorgeous blend of color and your home made snowflake looks phenomenal against that bright background! Love the rich contrast on this! An awesome stencil! It's so pretty embossed on these pretty, rich colors! Lucky me, getting to see this in real life! It is so beautiful in those vibrant colours! I love this look! Gotta CASE it as am working on building up my stash of Christmas cards. The idea of embossing the stencil over the brushos is new to me so want to give it a whirl. Thanks for your many wonderful and unique ideas. Oh how I LOVE the variation in those blues, and the crisp, clean white of the snowflakes...such a gorgeous Christmas card, Loll!